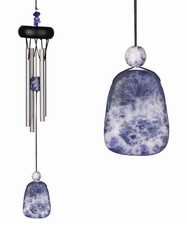 Woodstock's Precious Stones Chimes offer variations on a mystical theme. These chimes use stones that have significance and beauty, giving you twice as many reasons to add one of these chimes to your garden. Lapis is known as the stone of truth and openness. Small enough to go almost anywhere, hang this chime in your home or garden and let it open your heart and mind. Boxed for gift-giving.